Kristen McConnell received her M.Ed. in English in 2001 and her B.A. in English in 1998 from the University of Mary Hardin-Baylor in Belton, Texas. McConnell is currently enrolled as a part-time J.D. candidate for the class of 2021 at Stetson University College of Law. She also holds an A.P.S. in Paralegal Studies from Midlands Technical College in Columbia, South Carolina, graduating in 1995 after having served in Desert Storm with the United States Army. In addition to her military service, she possesses a wide range of international experience, working at the U.S. embassies located in Cairo, Egypt and Canberra, Australia as well as living in Berlin, Germany for two years. She has served as the resident director of the Stetson University College of Law summer study abroad programs in Oxford, England and The Hague, Netherlands as well as the fall intersession program in George Town, Cayman Islands. 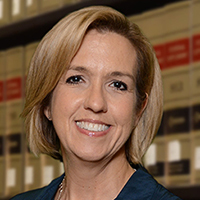 With a background steeped in academia, the legal field, and an international context, McConnell provides unique skills and knowledge to her current position at Stetson University College of Law as the associate director of International Programs.